In the article, “Why Professor Johnny Can’t Read: Understanding the Net Generation’s Text’s Mark Mabrito and Rebecca Medley (2008) argue that Net Generation (Net-Gen) have a different learning style due to them being digital natives, and the education system needs to be responsive to their learning style. According to Mabrito et al. (2008), the need for change in the education system is driven primarily by the new learning style of the Net Generation. Mabrito et al. (2008) are correct to suggest that the education system needs to adapt to the changing realities – but they are incorrect to identify Net Generation learning style as the agent for change. The change agent is the dramatic growth and influence of information communication technologies. Siemens (2004) argues that the shelf life of knowledge is diminishing at an increasing rate. The life of knowledge was previously measured in decades, whereas today it is measured in years and months. This issue transcends a particular learning style, or generation of learners. The need for the educational system to adapt to the changing realities of the world was acknowledged in the mid 1990s by a group of international researchers, known as the New London Group. 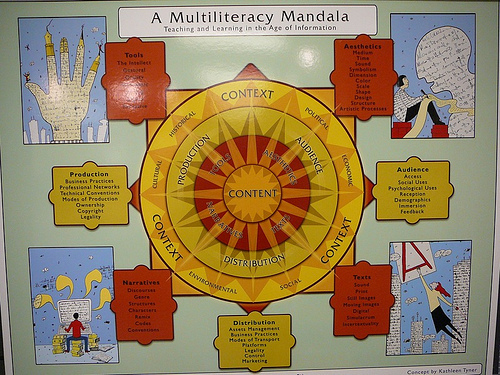 Their purpose was to rethink and revitalize literacy pedagogy, thus coining the term multiliteracies. Mabrito et al. (2008), argue that since the Net-Gen have primarily been learning in a digital world there is a disconnect between how they learn and traditional instructional methods. Hence, educators need to learn the Net-Gen’s learning style and make instructional changes accordingly (Mabrito et al., 2008). Undoubtedly, the Net Gen has had the most exposure to information communication technologies in their formative years, thus changing “how they read and write with words and images” (Williams, 2008, pg. 682). The real issue however, is that there are rapidly changing social, cultural, economic, and technological conditions that present a pedagogical challenge to the education system which is independent of one’s generation’s learning or communication style. By primarily focusing on Net- Gen’s learning style Marbrito et al. (2008) fail to identify the real reason for reforming the education system – for the education system to remain relevant it needs prepare people to “participate fully in “public, community and economic life” (London Group, 1996, pg. 1). Consequently, the authors’ rationale for change would not produce the desired goal of classroom adaptation and institutional support for change. The underlying premise of multiliteracies is that “teaching and learning need to change as the world is changing” (Cope et al., 2009, p.166). This premise is consistent with Marbrito et al.,(2008) argument for classroom adaptation, however, the underlying impetus for change pertains to universal relevance . In addition, multlliteracies pedagogy places an emphasis on process rather than merely subject content therefore it has relevance across all disciplines while serving the primary purpose of education as defined by the London Group. For example, Haeryun Choi and Joseph Piro (2009), and Amy Jensen (2008) argue that multiliteracies expands the potential of the Arts and establishes a clear link with employment opportunities for students’ of the Arts. In short, the emphasis on multiliteracies enriches the student’s learning experience and enhances their creative and technical skills for the labour market (Choi, H., Piro, J., 2009; Jensen, A., 2008). The rationale for classroom adaptation and institutional support needs to be on the basis that multiliteracies pedagogy because it links the revitalization with the characteristics of the new economy – an environment of collaboration, decentralized control and meaning making. Best Buy, for example, has recognized the human capital power of open and unorthodox communication by using collaboration (Tapscott, 2007). I believe a more persuasive argument is to clearly link the purpose of multiliteracies pedagogy with student success in the labour market, thus establishing an economic rationale for the change in the classroom. Government funding and educational institutions are far more responsive to industry and bushiness needs than they are perceived learning styles. If making pedagogical changes will enhance the success of their students and their programs in the corporate environment they will be open to incorporating informal learning practices into the formal educational system, thus providing a link to the changing global realities. Choi, H., & Piro, J. (2009, January). Expanding Arts Education in a Digital Age. Arts Education Policy Review, 110(3), 27-34. Retrieved June 3, 2009, from Professional Development Collection database. Mabrito, M. & Medley, R., Why Professor Johnny Can’t Read: Understanding the Net Generation’s Text. Innovate, Volume 4, Issue 6, 2008, pp. 1-7. New London Group. (1996). A pedagogy of multiliteracies: Designing social futures. Harvard Educational Review. 66 (1), 60-92.